Are Tinted Moisturizers With SPF Enough? Elta MD UV Clear Broad Spectrum SPF 46, $32, is a lightweight, oil-free sunscreen that’s great for protecting acne-prone and sensitive skin. It contains hyaluronic acid to moisturize and lactic acid to keep pores clear and reduce shine. Obagi-C RX C-Sunguard SPF 30, $50, contains zinc oxide in a creamy formula that’s good for normal to dry skin. La Roche Posay Anthelios 50 Mineral, $33.50, is a mineral-based sunscreen that’s ideal for sensitive skin. It feels weightless, sinks in immediately and dries to a soft matte finish. As for tinted moisturizers and BB creams with sunscreen, you can trust the following, which all contain self-adjusting pigments to take the guesswork out of getting a perfect match to your skin tone. 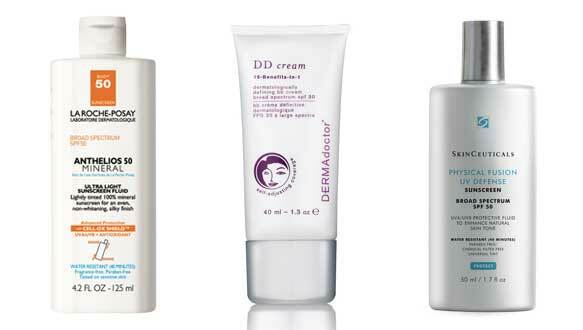 DermaDoctor DD Cream SPF 30, $38, is a mineral based sunscreen developed by Dr. Audrey Kunin that contains a white sapphire complex that self-adjusts to enhance your one own unique skin tone. SkinCeuticals Physical Fusion Defense SPF 50, $34, is a weightless, 100% physical sunscreen that provides water-resistant broad spectrum protection with transparent titanium dioxide and zinc oxide (Z-Cote®). It also contains artemia salina, a plankton extract, that increases your skin’s natural defenses and resistance to UV and heat stress. Supergoop Daily Correct CC Cream SPF 35, $32, contains potent antioxidants and triple protection from UVA, UVB and IRA rays, plus essential fatty acids Omega-3 and Omega-6 to neutralize discolorations and blotchiness, and minimize inflammation. A brightening apple extract and light-reflecting mica minerals boost radiance. Revision Intellishade Tinted Moisturizer SPF 45, $52, is also a self-adjusting tinted moisturizer, plus it has the peptide Palmitoyl Tripeptide-5, which helps to improve skin elasticity and firmness. Earlier this summer, we decoded some sunscreen lingo—it’ll probably come in handy. Plus, some fusion products actually work. Our faves here.